San Diego ant control by Hydrex Pest Control Co.
Hydrex does not treat plant pests as they are a lawn and garden problem. Origin: Possibly a native of North America, and found widely across the United States wherever birch trees grow. It primarily uses birch as its host plant. Biology: A pest of birch trees, where large populations can cause leaf dieback and copious production of honeydew, which coats surfaces below with a sticky layer. 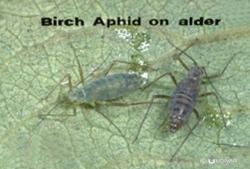 Females deposit eggs in the crevices of the bark on host trees in the fall, with new nymphs emerging in the spring to coincide with bud break on the trees. The first few generations may be wingless, parthenogenic females, and winged forms are produced in late spring to migrate to other trees. Identification: A large green to grayish species with very short cornicles. Wingless nymphs may be grayish or green, with winged females a light green color.